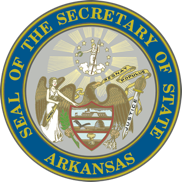 An individual must be registered with the Secretary of State’s Office in order to act as an athlete agent in Arkansas. An athlete agent is defined in Act 204 of 2011 as “an individual who enters into an agency contract with a student-athlete or, directly or indirectly, recruits or solicits a student-athlete to enter into an agency contract.”The term does not include immediate relatives of the student-athlete or an individual acting solely on behalf of a professional sports team or professional sports organization. The fee for an initial athlete agent registration or renewal in Arkansas is $500, payable to the Secretary of State. This fee must accompany the registration application. A certificate of registration or renewal is valid for two (2) years. the application in the other state was signed by the applicant under penalty of perjury. The fee for submitting an existing application from another state is $100 for initial applications and for renewals. For further information call the Secretary of State’s Office at 682-5070.